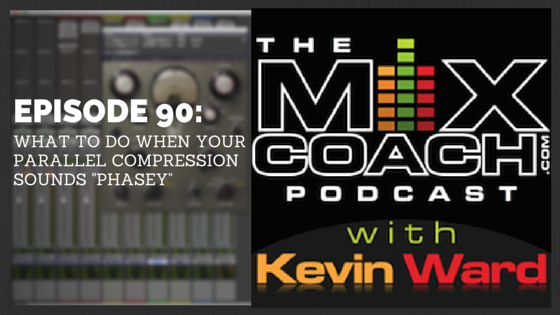 On this episode of the podcast, Kevin answers a question from one of our subscribers asking about parallel processing, and a “whooshy” or “phasey” sound that happens when he uses parallel compression. Kevin explains what causes these phase issues, and discusses a few simple ways to take care of it in your mixes. If you are not sure what phase is or would like to learn more about it, check out episode 71 of the MixCoach Podcast to learn How To Detect Phasing Problems In a Mix. Using parallel compression can add punch to drums, but can also cause phase problems if you aren’t careful. 1. Make sure you have delay compensation on on your DAW. If you are a Pro Tools user and would like to learn more about Automatic Delay Compensation in Pro Tools, check out this great article on ptdudes.com called Delay Compensation Explained! – Part 1 and Part 2. 2. Turn up the delay compensation. – On my pro tools system, I can actually set the maximum amount of delay compensation in milliseconds or samples. This phasey-ness you are getting could be caused from the system not being able to keep up with the amount of latency that your compressor of choice is causing. 3. Use a different compressor that does not cause as much delay. Enjoy the podcast and don’t forget to rate and subscribe to the MixCoach Podcast on iTunes or Stitcher, and Review us! If you missed the last episode Click Here! Five Things Every Great Mixer Knows! Click HERE to become a MixCoach Member today!